Yeah, OK, I'm a Derby Dad. The shoe fits; I'm wearing it. Those of you who have been around for a few years have seen the lengths I went to for Fiona's cars the last two years. Well, this year, it was Aiden's turn to get the full treatment. So, I asked Aiden what he wanted to make. Sky's the limit, I said — I figured I'd let him choose, and I'd worry about how to implement it. Well, Aiden went beyond the sky, and said he wanted a space ship. I heartily agreed, and we started sketching. Well, I started sketching, anyway. Where Fiona can't do enough on projects like this, I was finding it hard to keep Aiden involved past the first five minutes. I don't know why; I just haven't figured out how to connect with him and motivate him yet. He's a mystery to me in so many ways. So I did this largely in five- to ten-minute segments, as long as the attention held out. Maybe I'm a bad dad, I don't know. But I'm trying. Around the beginning of July, we watched the final flight of Atlantis, and something clicked in my mind. Instead of making up a spaceship, I asked Aiden, would you like to make a model of a real one? Aiden liked it, and the plan fell into place. 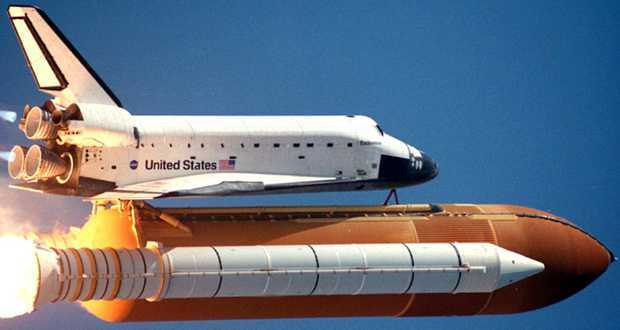 Fortunately, the details of shuttle design are well-represented on-line, and some quick calculations showed that the whole thing, tank, boosters, and all, would fit very neatly into the required pine car sizes at 1:300 scale. Better yet, there were plenty of patterns at that exact scale for people that liked to build paper models. A few printouts, and we had our blueprints. We could start cutting. One of the non-negotiable rules is that you have to use the block of wood that came with the kit. Here, I'm cutting the initial guides on the lathe. ...and cutting the shoulders down on the places where the wheels attach. There's a lot of sanding left to make this look good. Fortunately, Aiden enjoys sanding. This is something I have a hard time explaining; Fiona really enjoyed sanding, too, both of them way more than I expected. Maybe it's the "hands-on"-ness of it, which isn't there for the cutting or painting. Not sure. Another thing I learned? Emery boards are perfect for kids and sanding. you can get all kinds of little details, in sizes just right for little fingers. A few bucks for a pack of 50 is a bargain, too. The appropriate attire is essential to your pine-car building experience. Then it was time for painting. One of the things that has always frustrated me about the pine car derby is the fact that the weeks and months preceding it are almost without fail COLD. Spray paint doesn't dispense properly below about 50°F, and it's hard to get a really smooth finish without it. Fortunately for this car, we got the main painting done back in August. The rest of the cars had to be done indoors, in the shed, with the little wall heater running full blast for at least an hour ahead of time. I made some special holders for both the painting and the drying. It let me (or the kids) hold the piece, while the other person did the painting. I'll be using these for many, many years, I think. Hand painting, believe it or not, is more work than all the prep necessary for spray painting. Aiden got a lot of coaching on technique. The final product went together the night we had to turn the cars in. It's the last-minute details you're proud of. I needed to add a few tenths of an ounce to bring the weight up to the 5.00 oz. maximum. I was about to unscrew the brass fitting I'd set into the back of the tank, and add lead shot, when I noticed a bullet tip among the weights offered at the last-minute pine car workshop before we turned them in. A little drilling, a little super glue, a perfect rocket nozzle. I'm pretty happy with how the final product came out. Aiden was, too. I left the remains of the turning on the front of the tank, but cut it down to serve as a rest for the car to sit against the starting pin. Andy to Aiden: We are go for launch! I've been twitching all week. I'll look at the date, and suddenly panic: ay ay ay ay, I forgot to pay the.... oh, wait. And then I remember. It's been a habit over the last 14 years, dutifully plugging away every month, sometimes more as finances allowed. But with our latest tax return, one little long-term goal finally came to fruition. Patience Corners is ours. All ours. If I've never explained it before, Patience Corners is the name of our house — our little cottage down by the lake. It's common here to have the name of the house out front; Shamrock, Wawataysee, Hannah Harbour, Tailwind, Aspir-Inn, and many more. We just never got the sign made. Yes, it's the name of a quilting pattern — Deborah named it — but in our minds it pointed to the four (now three...) towering maples at each corner of our property, and for the odd resignation that we were settling in here for a while. For someone who has moved, on average, once per year until that point, buying a house was like merrily wrapping ourselves in chains; like dropping the balled roots of a tree into the soil and filling in the hole. It seemed so reckless, a permanent solution to a temporary problem. But here we are. The longest either of us have ever lived in one place. Stable enough that other people have moved to be closer to us. Long enough to stretch out into the loamy soil, and find that it's not bad to be rooted. We told the real estate agent what our price range was. She laughed. And then she looked at us with amused pity, loaded us into her Cadillac, and took us all over Warsaw to look at houses that fit the bill. Most of them were awful. Huge, gaping holes in the floors. Huge, gaping holes in the roof. Bedrooms that wouldn't even fit a bed. Dark, dreary places, filled with the stench of cigarette smoke and littered with old Penthouse magazines. We were pretty discouraged as we rolled up to a little white house down by the lake. "I saved this one for last," our agent told us. We walked in. It was bright and airy, with big windows, fresh paint, and new carpet. There was plenty of room for us and our stuff. "We'll take it," we told her, and she whipped the paperwork out of her purse, already half filled out. We wrote the offer on the kitchen counter. Deborah wanted to wheel and deal, lowballing the offer. I fixed her with what I hoped was a steely gaze. "Which of those other places do you want to live in if we don't get this house?" We offered the full price with a sage nod from the realtor. "Now, if you don't mind, kids, I'm going to leave you here. I'm going to take this directly to the seller." We gave a happy shrug, and she was off. Good thing, too: while the sellers were signing to accept our offer, a competing offer was coming in on the fax machine. We got this place by five minutes.